There is confusion around branding because there are multiple definitions of it. Branding used to be defined as a name, slogan, logo, or design that identifies products or services of a company. It was also identified as the elements that differentiated the goods or services from the competition. Today, branding is a bit more complex than what it used to be. It goes way beyond just a name, logo, slogan, or graphic element. Today branding is the perception that a consumer has when they hear or think of a company, service, or product. When you think about your brand, you really want to think about your entire customer experience. This includes everything from your logo, your website, your social media experiences to the way your customers interact in your brick and mortar store (if you have one). A good brand doesn’t just happen; it’s a well thought out and strategic plan. It’s critical to be aware of your brand itself and your brand experience. Many small organizations and start-ups neglect to spend necessary time thinking about their brand. So how do you know if your brand is strong enough to give you the internal and external value that you need in your marketing? Does your brand relate to your target audience? Does it share uniqueness that sets it apart from its competitors? Will your brand tell consumers why it’s important and what it offers? Does your brand reflect the values that you want to represent? Can/Will your brand attain & retain loyal customers and employees? Does your brand create an emotional connection with consumers? Let these questions serve as a guideline in the development of your brand. If the answers are not clear you may want to return to the drawing board and refine the branding process. So why is branding of the utmost importance? It is important to remember that your brand represents you. You are the brand, your staff is the brand, your website is the brand, your marketing materials are the brand. In a world with millions of brands, it is critical to stand apart from the crowd. You are no longer just competing on a local stage, you are now competing in the global economy. So, how do you stand out from all these other brands? It’s important to spend time investing in researching, defining, and building your brand. The brand is a foundational piece in your marketing. 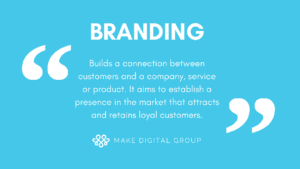 Branding is not only about getting your target market to select you over the competition but about getting consumers to see you as the provider of a solution to their problem. If your branding is consistent and easy to recognize, it can help people feel more at ease purchasing your products or services. Even if consumers are newly introduced to your brand, the stronger and more recognizable your branding is, the more likely your brand will be kept top-of-mind with them. Branding not only creates loyal customers, it also creates loyal employees. A clear brand strategy provides the clarity that your staff needs to be successful. It gives them something to believe in and something to stand behind. Brand strategy tells employees how to act and how to meet the organization’s goals. It also helps them understand the purpose of the organization or the business. It’s no secret that it’s easier to sell a brand that you believe in. This notion supports the marketing department’s ongoing efforts for consistency in presentation and contributes to the overall strength of the brand. People love to tell others about the brands they like. People wear brands, eat brands, listen to brands, and they’re constantly telling others about the brands they love. On the flip side, you can’t tell someone about a brand you can’t remember. A clear brand strategy helps you stay focused on your mission and vision as an organization. Your brand can help you be strategic and will guide your marketing efforts by saving time and money. With the infinite number of choices offered to consumers these days, many companies are looking for unique ways to connect emotionally with consumers. Purchasing is an emotional experience and having a strong brand helps people feel good when they purchase from or engage with your company. With each touch point being an opportunity to increase brand awareness and to improve customer loyalty, marketers today know and appreciate the importance of building a strong brand. So remember… your brand is not what you say it is, it’s what THEY say it is. If you need to further develop your brand, MAKE can help.